Such a nice night. It would be a waste to spend it indoors, eh? We decided to go to a Kings game, but before that, wanted to find a restaurant with an outdoor patio. 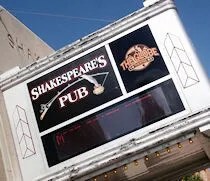 I checked Yelp and came across Shakespeare’s. It’s a place I’ve wanted to go to for a while, but always been somewhat hesitant because I’ve heard it was very, very smokey. Since I don’t have to worry about that anymore, it became our choice for dinner. 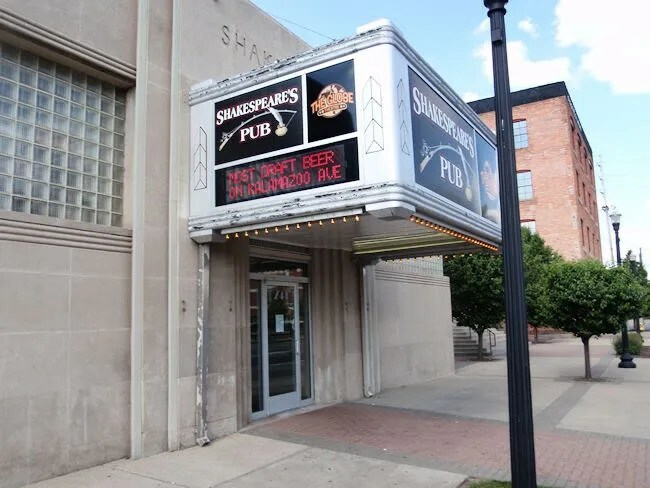 Shakespeare’s Pub is on Kalamazoo Avenue and Edwards Street. It’s in the old Shakespeare Rod and Reel building. Not being a Kalamazoo native, I always assumed it was named after the playwright. I actually thought the building was an old theater that had been converted. There’s a good story on the pub’s website about how the owner’s knew most people would think like I did and they incorporated both the fishing reel and the poet into the logo. Unlike most downtown businesses, parking is not an issue. There’s a huge parking lot on the west side of the building. When you enter underneath the marquee, you’re faced with a choice. Upstairs or downstairs. It’s not a difficult choice. The pub is upstairs. The Globe Theater is downstairs. We headed upstairs into the large, open pub space. The dining room is actually pretty nice. It’s very spacious and has free wi-fi. We wanted to sit outside though, so we headed to the glass doors that lead to the large outdoor patio. We were pretty early, so the dinner rush hadn’t started yet. There was only one other group outside and we sat on the opposite end of the patio. There is a choice of either picnic table seating or patio furniture. We chose the patio furniture which included plastic chairs. We were a little worried no one would notice out there, but not long after sitting down, a waiter came out with menus. I barely had time to look at the beer list which was already on the table. We both ordered Oberon’s then went to work trying to make a choice for dinner. A different waitress brought our beers out to us then she became our server. By the time she got back with the drinks, we had both made our decision. Nothing surprising from me. The menu claims they have “nearly famous square pizza.” We had pizza last night. Damn. Would have liked to try it. Instead, I went with the . 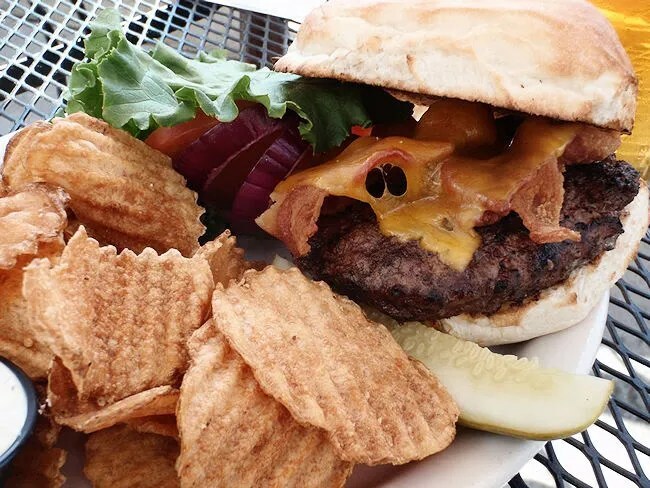 The sandwich is a 1/2 lb of meat on a grilled bun with bacon and cheddar cheese. The burger was great. I could have went a little bit pinker on the meat, but the bacon was crispy and the cheese held everything together. The bread really worked well with this sandwich. It wasn’t the typical generic bun. It looked like it was something either homemade or special made for the pub. For the side, I chose the Pub Crisps. They’re basically home made potato chips, but they’re cut a little bit thicker. They come with a cup of home made French Onion Dip. Here’s where I get a little weird. I hate onions. I actually like French Onion dip. Don’t know why, but growing up, my dad always dipped his Ruffles in Dean’s French Onion Dip. The Crisps were fantastic both ways. By themselves and with the dip. The dip didn’t have an overly strong onion taste. It was a pretty mild onion flavor which is how I like it. The Crisps were very crispy and lightly salted. I lost a few of them to J, but I was happy to share. J decided on the Cherry Chicken Salad. 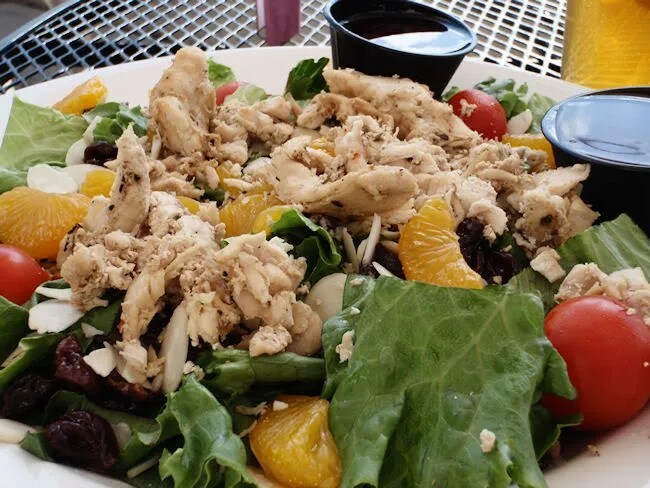 The salad starts with fresh green leaf lettuce then it’s topped with diced chicken breast, Mandarin oranges, dried cherries, sliced walnuts, and cherry tomatoes. The dressing she chose was a Cherry Vinaigrette. She usually leaves chicken off these salads, but this time, the chicken actually worked. It was cut small enough and it wasn’t greasy, so it didn’t ooze chicken juice on to the whole salad. Her favorite part by far was the dried cherries. She seeked them out and was a little disappointed when she couldn’t find anymore. Dried cherries, walnuts, and oranges on a salad is always a winning combination for J and this was no different. Our bill was surprisingly cheap at only $21. I assumed the beer was going to be $4 a glass, but it was only $5 for both of them. Had I know, we probably would have gotten a couple more. Shakespeare’s Pub was a good choice for us. Food was great. Service was pretty good considering we were outside and sitting pretty far away from a table that would have been more convenient. The huge patio is nice. I can see it as a great gathering place this summer and it’s one of those places I’m pretty happy we can go to now and not have to worry about whether or not we’ll be able to breathe.